Clean contemporary styling makes our Cirque pillar holders an essential ingredient for modern decor. 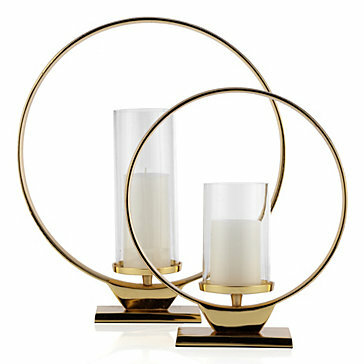 Crafted of polished Gold metal with a sleek sensibility, each pillar holders is encircled by a wide band of textural hammered metal which surrounds the elevated pedestal stand. A circular metal plate holds a glass sleeve to protect the flame of a standard pillar candle. Available in two sizes to assemble a pair or grouping. [value] => I loved it, true to the picture. [value] => It's very nice and fits well with my dining room credenza. I got both 19in and 15in. However, there were some dents in the ring frame. It's not too noticeable unless you pay close attention to detail. The glass candleholder does vibrate if you walk by it. I would recommend buying it in store so you can look for the best one. Packaging was good. I loved it, true to the picture. It's very nice and fits well with my dining room credenza. I got both 19in and 15in. However, there were some dents in the ring frame. It's not too noticeable unless you pay close attention to detail. The glass candleholder does vibrate if you walk by it. I would recommend buying it in store so you can look for the best one. Packaging was good.